The film Cheetah is a live-action film from Walt Disney Pictures that is shot and takes place in Nairobi, Kenya. 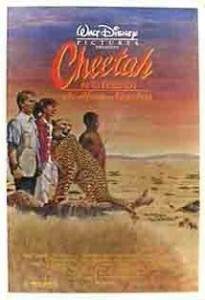 An American boy and girl spend six months in Kenya with their scientist parents, adopt a female cheetah they call Duma, and realize they must set her free so she can thrive in the wild. However, she is soon captured and the kids travel to head off into the wild to rescue Duma. Hartley, Jean. Africa’s Big Five and Other Wildlife Filmmakers: A Centenary of Wildlife Filming in Kenya. African Books Collective, 2010. Project MUSE. Web. 3 Dec. 2013. <http://muse.jhu.edu/>.